The 22nd edition of Passenger Terminal Expo, held at ExCeL London on March 26, 27 and 28, 2019, has now officially closed, with John Holland-Kaye, CEO of Heathrow Airport, perfectly summing up the event as "a wonderful way to steal the best ideas from other airports" during his opening speech on the first morning of the Passenger Terminal Conference. The exhibition and conference combined saw a total attendance of well over 10,000 from more than 1,500 organisations and 130 countries, smashing previous figures and setting a new record, while further cementing the show's status as the world’s leading international airport event. 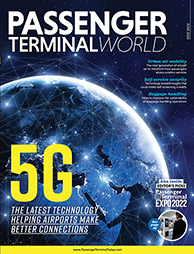 More than 350 specialist airport technology suppliers presented their latest innovations across more than 19,000m2 of exhibition space, with the 2019 event seeing a particularly strong focus on new biometric-enabled, self-service and data-driven solutions to speed operational throughput and improve the passenger experience. Product launches included Panasonic’s take on the One ID end-to-end biometric security solution; CCM’s latest modular bag drop units; revenue and passenger flow software from Veovo; and voice-activated, self-service kiosks from Etihad Airways and Elenium. Held in London, home to some of the world's leading architectural firms, this year's show also saw some breathtaking displays from the designers of the most exciting new airport developments, including Zaha Hadid Architects, Foster + Partners, Grimshaw, and AECOM. Meanwhile the Passenger Terminal Conference brought no fewer than 400 expert speakers from the world's leading airports, airlines, architects, aviation suppliers and consultants together to share their latest insights and project updates across nine daily streams for three days of intense discussion, debate and networking. Some 1,500+ delegates from more than 100 countries were once again unanimous in their praise of the event. Another highlight saw the annual hosting of the Skytrax World Airport Awards during the second evening of the show, live from the exhibition floor, with Singapore Changi Airport crowned as the World’s Best Airport. It is the seventh consecutive year the airport has claimed the top prize, and the tenth time in the 20-year history of the awards. To read all the latest show news, please click here. Next year, Passenger Terminal Expo will return to Paris, France – the dates for your diary are 31 March, 1, 2 April, 2020.